BERLIN (AP) — A vast international experiment designed to demonstrate that nuclear fusion can be a viable source of energy is halfway toward completion, the organization behind the project said Wednesday. 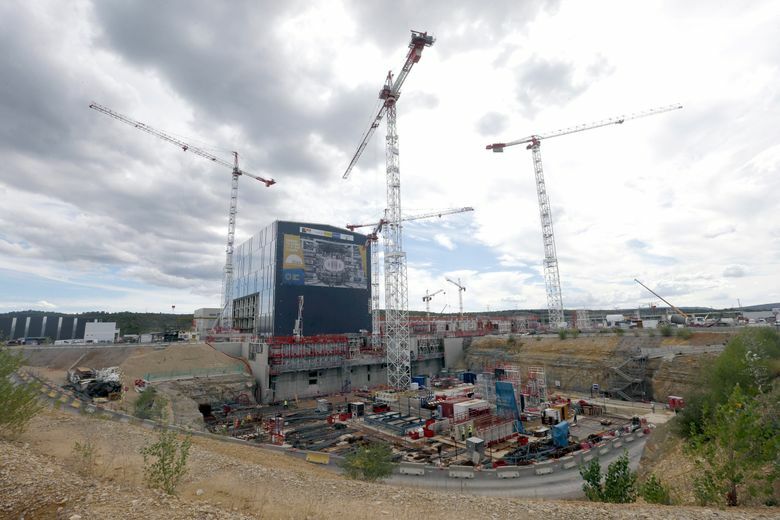 Construction of the International Thermonuclear Experimental Reactor, or ITER, in southern France has been dogged by delays and a surge in costs to about 20 billion euros ($23.7 billion). “We have no contingency plan,” he told The Associated Press in a phone interview from Paris. Scientists have long sought to mimic the process of nuclear fusion that occurs inside the sun, arguing that it could provide an almost limitless source of cheap, safe and clean electricity. Unlike in existing fission reactors, which split plutonium or uranium atoms, there’s no risk of an uncontrolled chain reaction with fusion and it doesn’t produce long-lived radioactive waste. It took more than two decades for work to begin at the site in Saint-Paul-les-Durance, about 50 kilometers (30 miles) northeast of Marseille. The project’s members — China, the European Union, India, Japan, South Korea, Russia and the United States — settled on a design that uses a doughnut-shaped device called a tokamak to trap hydrogen that’s been heated to 150 million degrees Celsius (270 million Fahrenheit) for long enough to allow atoms to fuse together. The process results in the release of large amounts of heat. While ITER won’t generate electricity, scientists hope it will demonstrate that such a fusion reactor can produce more energy than it consumes. There are other fusion experiments, but ITER’s design is widely considered the most advanced and practical. Scientists won’t know until 2035, following a decade of testing and upgrades, whether the device actually works as intended. Still, fusion experts said Wednesday’s milestone was noteworthy. 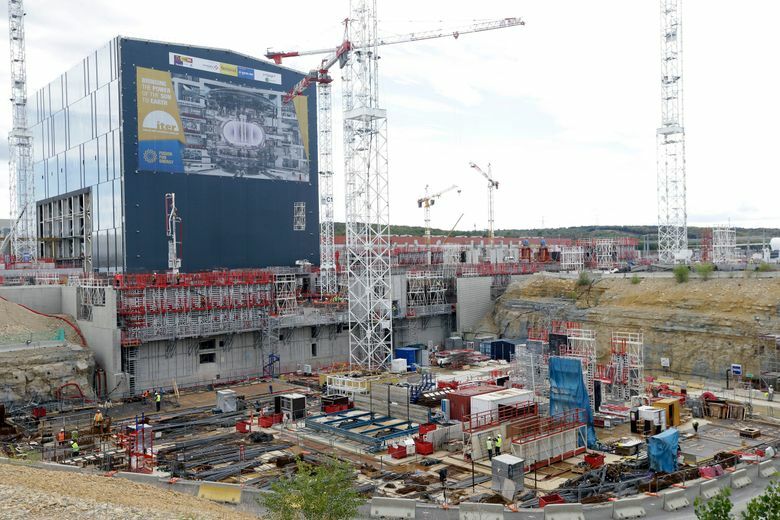 “The glass is half full, rather than half empty,” said Tony Donne of EUROfusion, a consortium of European research organizations and universities that provide scientific advice for ITER. Donne said the appointment of Bigot had helped the project overcome what he called a “very difficult period” during which political considerations had hampered construction of what some consider the most complicated machine ever built. Cost remains an issue, though, and Bigot was visiting Washington on Wednesday to drum up support from the United States, which contributes about 9 percent of the budget. Much of the funding goes to suppliers in the member states — in the case of the U.S. that includes General Atomics, which is building the central solenoid, an 18-meter (59-foot) electromagnet that’s powerful enough to lift an aircraft carrier. Bigot said most other members, including the European Union which pays 45 percent of the budget, had pledged their financial support for years to come and he was hopeful the Trump administration would see the benefits of staying on board. “All countries including the United States know that their energy supply is not sustainable beyond this century,” said Bigot, who was previously France’s nuclear energy chief. Gerald Navratil, a professor of applied physics at Columbia University, said fusion could help solve the problem of how to reliably produce large amounts of electricity without emitting greenhouse gases, noting ITER’s current cost is comparable to that of developing a large passenger aircraft. “Energy is such an important part of our technological society that expenditure of 20 billion to develop a new energy source is really not out of line,” he said.